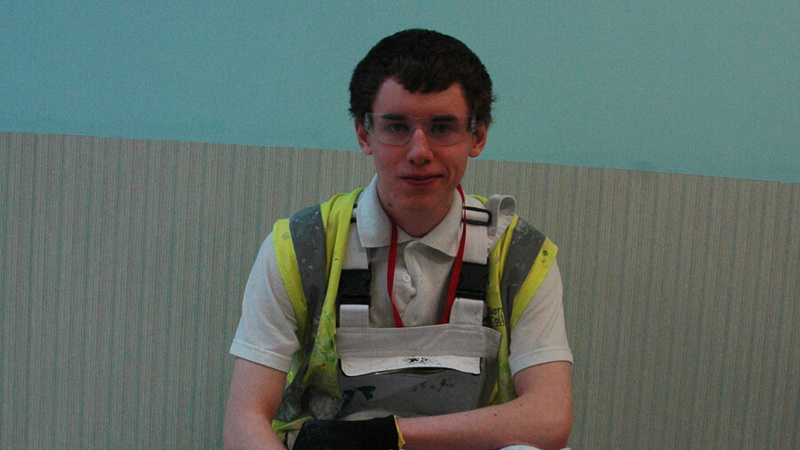 Construction apprentice Sam Leak is celebrating after winning a painting and decorating competition set by one of the world’s leading suppliers of paints and coatings, PPG Industries. Staff from the technical department at PPG Industries came into the College and provided the Level 2 and Level 3 Painting and Decorating Apprentices with a presentation about the company and the careers and progression routes available within the industry. They also informed students of the benefits of the finishing and coatings of their product range for Leyland Paints and Johnstone’s Trade Paints and included a demonstration of a new type of product that is now available on the market. After the presentation the students’ painting skills were put to the test when they took part in a competition set by PPG Industries. Students were set a time limit to complete a painting exercise to test their cutting-in skills. They were judged on the accuracy and presentation of the finished piece. Sam, a Level 3 Painting and Decorating Apprentice, was crowned the winner and presented with a bag of goodies and a painting tool kit from PPG Industries. He was also invited to take part in the Johnstone’s Young Painter of the Year competition, a prestigious annual painting and decorating competition which celebrates young talent across the UK.